Daryl scores again in Panjim Footballers' Goa Pro League win! Home / Indian Football / General / Daryl scores again in Panjim Footballers’ Goa Pro League win! Daryl scores again in Panjim Footballers’ Goa Pro League win! 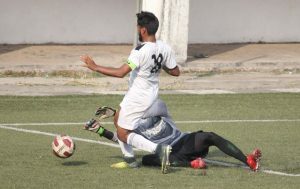 Daryl Costa’s 74th minute strike enabled Panjim Footballers register their second consecutive win in the Goa Professional League beating Calangute Association 1-0 at the Duler Stadium in Mapusa on Thursday. The all important goal was scored in the second half when Snedden Rodrigues played a lofted through pass to Daryl, who made no mistake to guide the ball in the back of the nets. They now move on to eleven points from eleven games. In the first half, neither sides were able to break or create any promising moves. But the second half saw lot of actions wherein Panjim looked more threatening and should have scored through Snedden early in the second half. But strong defending from Calangute held the score line 0-0 till the 74th minute that’s when Daryl came with the much needed breakthrough and the three points for Panjim Footballers. Previous XtraTime VIDEO: East Bengal plan big for 100th anniversary! Next VIDEO – PUMA: Romelu Lukaku. POWER UP. Unlock New Levels!